Golden Peony at the Conrad Centennial Singapore has always been a quietly elegant space for fine Cantonese dining. I remember some pretty good dim sum here a few years back. Every lunar new year, Executive Chinese Chef Ku Keung introduces new dishes that will be on the main menu for rest of the year (see link for details). 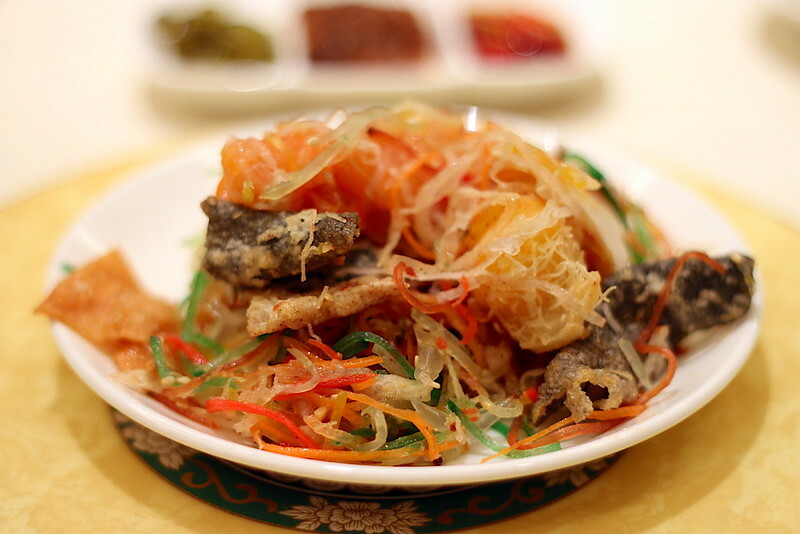 You'll see some of these below, but first let's take a look at their MEGA yusheng offering which easily feeds 30 or more! It's great if you need to cater for a large extended family or company lunch. 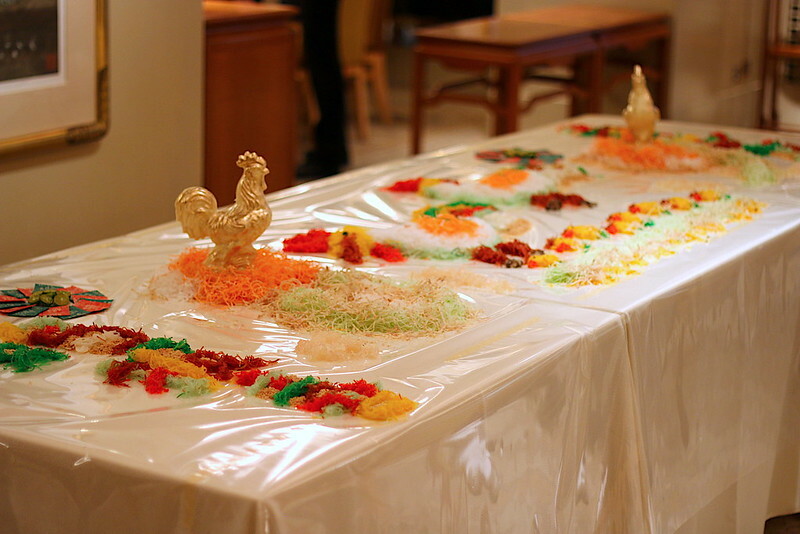 The yusheng is so huge, it needs to be laid out on several tables. The rooster figurines are edible chocolate containing more edible goodies (ingots) and treasures. You get toy mallets to smash the rooster, which just adds to the fun of lo-hei. Not surprisingly, you'll need to reserve this at least one day in advance. 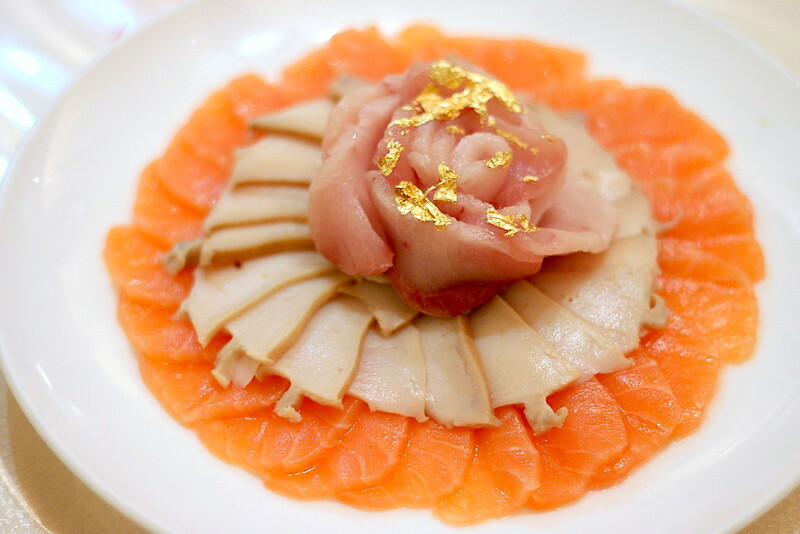 The Kanpachi, Abalone, and Salmon comes in a beautiful rosette anointed with gold leaf. And the kicker? Crispy fish skin! I live for the crunchy elements in yusheng. It's the only truly savoury part of this big sweet salad. This is a crowd favourite and it's easy to see why. 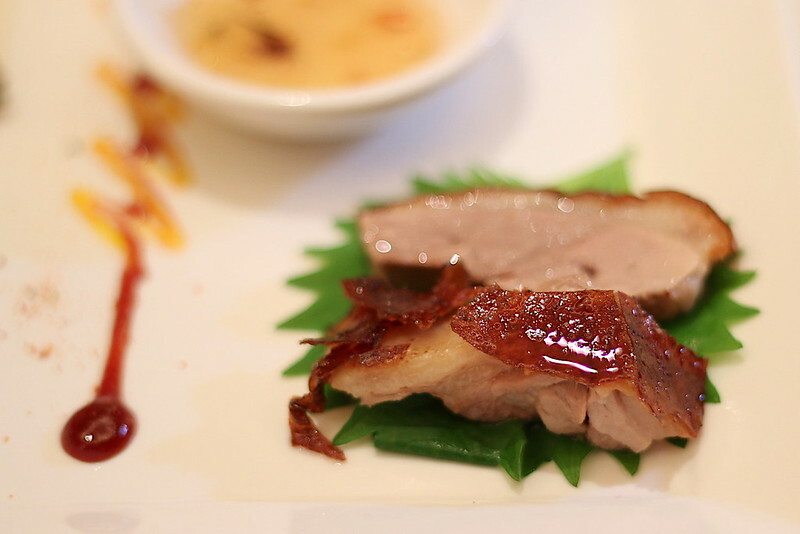 The duck is beautifully roasted and its juicy flesh is topped with a lusciously gleaming crackling skin. It's also available for takeaway at S$98+. This was really good. 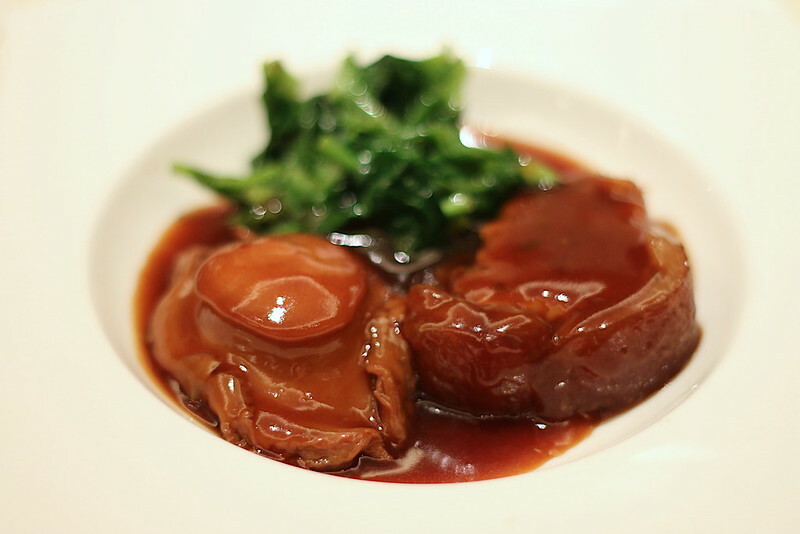 The full-flavoured braising sauce is a lovely reduction, silky and thick. The sea cucumber had a nice tensile bite to it, while the mince patty provided delicious bulk. The "Bi Feng Tang" Golden Half-Lobster with Spiced Almond Flakes (S$38++ per person) features a light crispy batter and tender flesh. All the fried garlic and chili just makes this so delectably savoury. 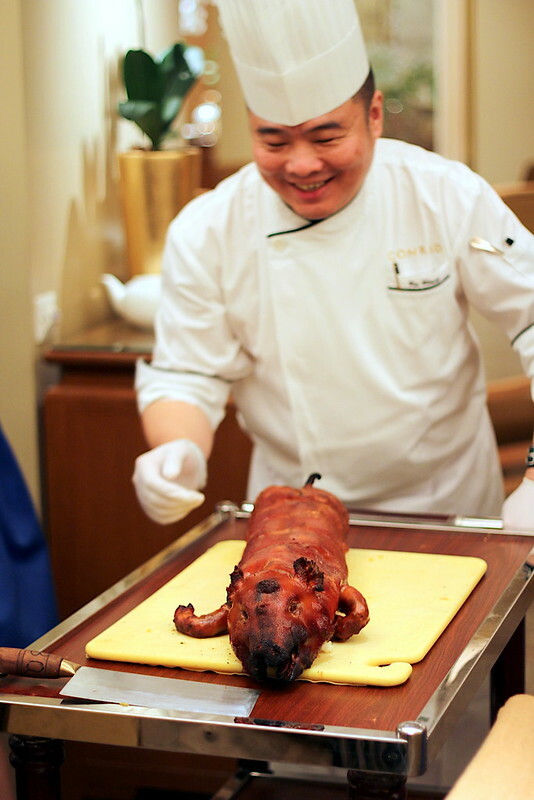 Chef Ku also does a different style of roast suckling pig each year. In previous years, he has played with various kinds of glutinous rice stuffing. He likes to innovate with new ingredients, so this year, the piglet is stuffed with...*drum roll*...California maki. The suckling pig itself is gorgeous, but I have to say the Japanese maki, although unusual, was a strange match. There was also too much rice. 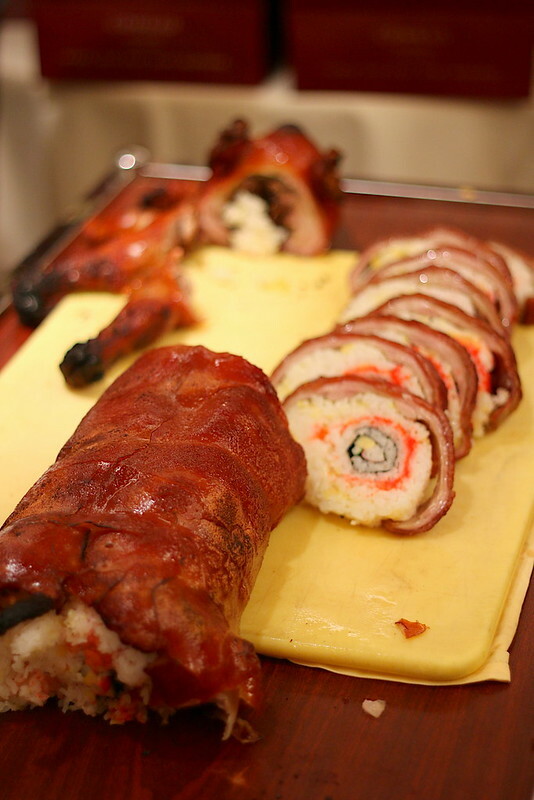 Maybe if it had more ingredients in it, it might work but I reckon it's not easy to stuff a full roll into the piglet. This is absolutely exquisite. 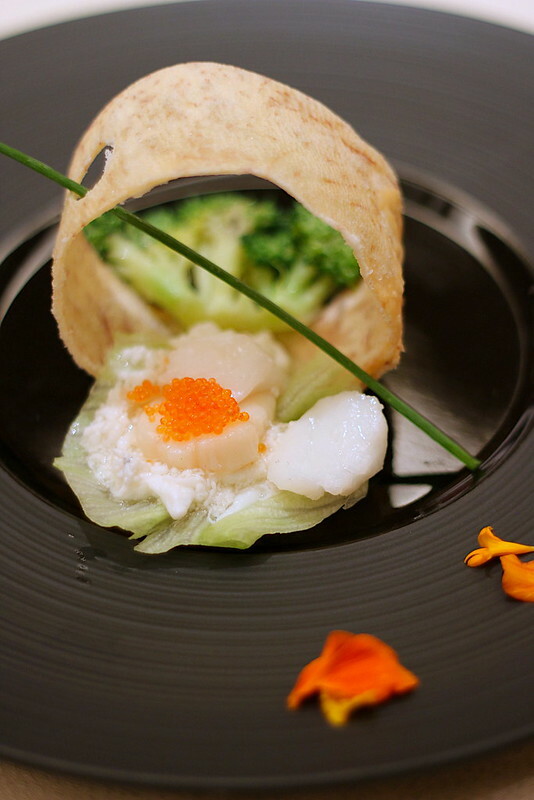 Fluffy egg white with scallops is always a delightful pairing with broccoli, and the crispy yam bracelet is a treat. Note that what's shown is a tasting portion; the actual one feeds 2-4 pax (S$38++). 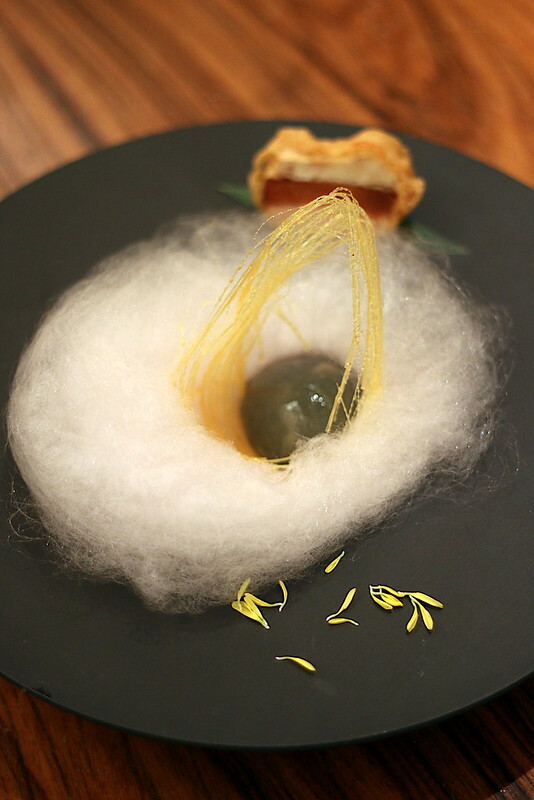 They got decidedly creative with dessert: a jelly egg filled with bird's nest ensconced in a nest made of cotton candy floss, and embellished with golden spun sugar. You can't help but be wowed. Theme-wise, it's perfect for the Year of the Rooster.